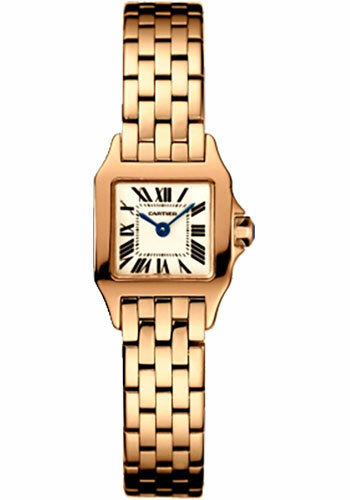 Mini size (24mm x 18.7mm), 18K pink gold case, silver dial, quartz movement, 18K gold bracelet. Water resistant to 30 meters (100 feet). Mini size (24mm x 18.7mm), 18K white gold case set with diamonds, silver dial, quartz movement, 18K gold bracelet. Water resistant to 30 meters (100 feet). Mini size (24mm x 18.7mm), 18K white gold case set with diamonds, silver dial, quartz movement, 18K white gold bracelet set with diamonds. Water resistant to 30 meters (100 feet). Mini size (24mm x 18.7mm), 18K pink gold case set with diamonds, silver dial, quartz movement, 18K gold bracelet. Water resistant to 30 meters (100 feet). 24mm x 18.7mm 18K pink gold case set with 48 brilliant cut diamonds, 5.5mm thick, octagonal shaped crown set with a cut diamond totalling 0.37 carats, sapphire crystal, silver dial with blued steel-sword shaped hands, quartz movement, brown alligator skin strap, 18K pink gold ardillon buckle. Water resistant to 30 meters. 24mm x 18.7mm 18K white gold case with rhodium-finish and set with 48 brilliant cut diamonds, 5.5mm thick, octagonal shaped crown set with a cut diamond totalling 0.37 carats, sapphire crystal, silver dial with blued steel-sword shaped hands, quartz movement, black alligator skin strap, 18K white gold ardilon buckle. Water resistant to 30 meters.